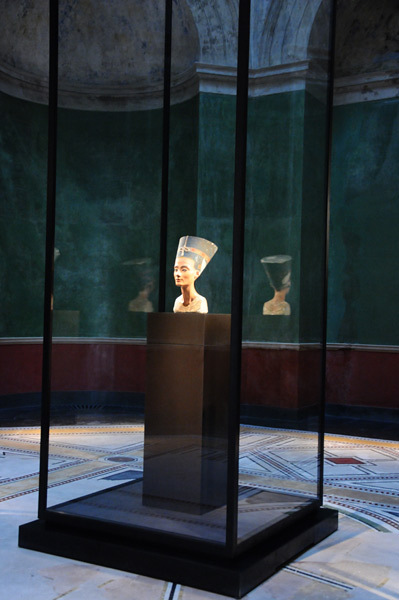 An entire room is set aside for Nefertiti. She is joined only by James Simon who funded the excavations in Amarna and acquired ownership of the bust when the finds were divided and bequeathed it to the National Museums in Berlin. The gaze of the Sun Queen goes through the rooms of the New Museum right through to the south dome where it meets the statue of the sun-god Helios from Alexandria. 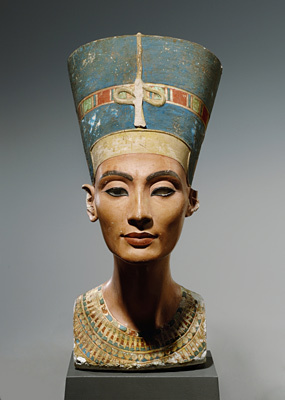 The bust of Nefertiti was created around 1340 BC by the court sculptor Thutmose, in whose studio in Amarna she stood as a sculptor�'s model. The limestone core was given its final form by several layers of stucco on the crown and shoulders, and there are also small areas of stucco patching on the face - made visible under the paint by the use of computer tomography. The individuality of the artist and the personality of the queen unite to bring immediacy to the expression �'beyond time and space�'. Inv.-No. 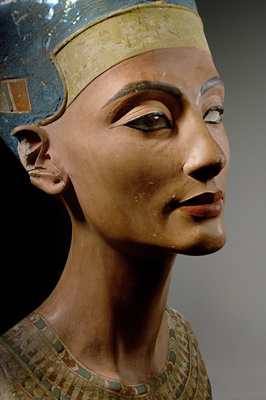 ÄM 21300 This bust is one of the first ranking works of Egyptian art mostly due to the excellent preservation of the colour and the fine modelling of the face. She was found in 1912 during the excavations of the German-Orient-Association in city of Achet-Aton, today known as Amarna. 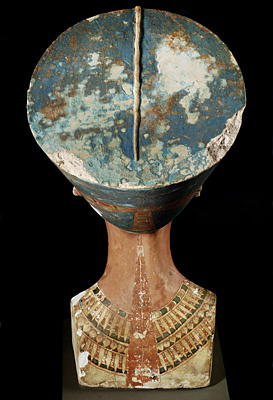 The individualized face and the special crown, tall, flat-topped decorated with a ribbon and the remains of a uraeus at the front identify the statue as Nefertiti. 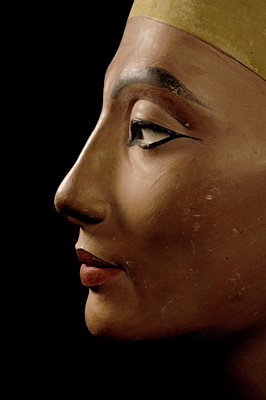 The bust served , as did many other masks found in the workshop of the Tuthmosis, as a model for artists producing portraits of the queen. She is shown as a grown woman with a harmonic and balanced beauty which is not disturbed by the slight folds under the eyes and chin as well as the slightly sunk cheeks. The bust is made of limestone which is covered with modelled gypsum. The eye is inlayed with crystal and the pupil attached with black coloured wax. The second eye-inlay was never carried out.